The opposition is baying for the government’s blood over demonetisation and GST. The first is done and over with. But its effects are not yet over. The second has been modified to assuage large sections of the population. The government continues to insist that demonetisation will help curb black money. Maybe it will. The money that has been put into bank accounts (since very few of high value notes got ‘impounded’ or cancelled by the government) will help the government track down accounts which saw a surge in deposits. That will enable the tax authorities to track down the sources of these deposits. According to media reports, attributed to highly placed tax authorities, more than Rs 2 lakh was deposited in over 60 lakh bank accounts post-demonetisation. The total amount involved is over Rs 7.34 lakh crore. These accounts are now under scrutiny. 8 lakh or 60 lakh? That may be so. However, there are good reasons to believe that the Finance Ministry could haul up bigger fish by just scrutinizing some 8 lakh accounts, instead of pursuing 60 lakh accounts. These are the people who submitted agricultural income tax returns in 2011-2013 (see chart alongside). Watch the table closely. 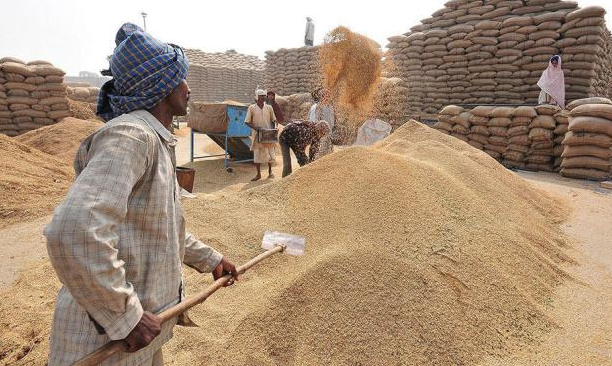 The total number of returns filed and which showed agricultural income surged from 425,085 in 2011, to 656,944 in 2011. This number climbed further in 2012 to 812,426 in 2012. But more astonishing is the amount of money involved. Collectively, the amount claimed as agricultural income was Rs 84,742 crore (average amount per assessee Rs 19.lakh) in 2010. If that made you gasp, watch the amount declared for 2011. It jumped to (hold your breath) Rs 19,971,098 crore (Rs 3,040 lakh average per assessee) in 2011. It did not stop at this level. It climbed further to Rs 67,431,358 crore (average Rs 8,300 lakh) in 2012. The collective amount for the three years comes to an astounding Rs 86,486,197 crore (Rs 865 lakh crore). It is astounding, because the GVA (gross value added) for the country was only Rs 8,546,552 crore, Rs 9,084,369 crore and Rs 9,727,490 for 2010, 2011, and 2012, respectively. The total GVA for the three years together comes to Rs 27,358,411 crore. What this means is that the total agricultural income filed with the IT authorities was three times the total GVA for the three years. If only 2011 and 2012 are taken into account, agricultural income declared was almost 5 times the GVA for those two years. Preposterous! That effectively means that agricultural income was even greater than India’s GDP or GVA! Unbelievable! But that is what the numbers say. Some taxmen tried to pass this off as data-entry errors. But that is implausible. This is because any income over Rs 20 lakh has to be fed into the income tax servers directly by the assessees. If the figures are wrong, the assessees should be hauled up and penalised for wrongful entries. The entries should then be cancelled and treated as null and void. Else, they should be prosecuted and fined for concealment of income. Neither has happened. The Finance Ministry is silent about this. So are the income tax authorities. In fact, the income tax on such declarations could be large enough to account for almost 100 years of total taxes collected. That could actually make Prime Minister Modi’s plan for giving money back to tax payers a reality. The genesis of these discoveries lies in a series of accidents. The first figure that emerged was a mind-boggling amount of Rs 2,000 lakh crore. This was almost two and a half times the Rs 865 lakh crore given in the table alongside. This figure emerged in an affidavit filed by a retired Income Tax (IT) officer — Vijay Sharma. He had filed an RTI (Right to Information) request with the income tax department for the amounts declared as agricultural income. He claimed that he had indicated an exponential increase in agricultural income from 2004 to 2013, touching a total of almost Rs 2,000 lakh crore for 6.57 lakh individual assessees in 2011. He then asked for the top 100 names of the people who had filed such returns. His RTI request was denied. He then decided to file a public interest litigation (PIL) petition with the Patna High Court in Bihar. This matter was duly reported by media in March 2016. The court was supposed to hear the petition in April in that year itself. But the courts, too, have been silent on this matter. 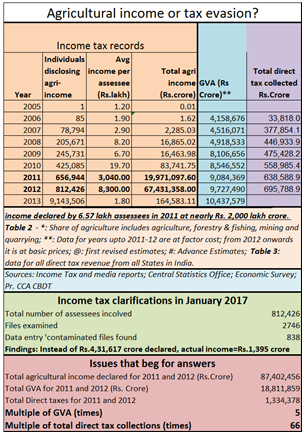 Almost simultaneously, the income tax department gave out a different set of figures (see table 1) which was dutifully reported by the media. At the same time, thanks to the PIL before Patna High Court, the CBDT – on 10 March 2016 — sent out a circular to all its officers to verify details (LETTER F.NO.DGIT(S)/DIT(S)-3/AST/PIL MATTER/AGRICULTURAL INCOME/97/2015-16) . It confirmed that there had been a surge in agricultural-income returns. It also attempts to suggest a way to wriggle out of this mess. And this brings us back to demonetisation. Remember, demonetisation involved just Rs 15.4 lakh crore. The total currency in circulation is under Rs 20 lakh crore. And Rs 865 lakh crore was many times these levels. Of course, the one question that automatically arises is – why is the focus on agricultural income so crucial? The reason is simple. Agricultural income is tax exempt, provided it is declared as agricultural income with the tax authorities. That has given rise to several theories. Someone possibly tipped off some of the most powerful people in India during 2010. Maybe, there was an amnesty scheme round the corner. Maybe, there was an assurance that no questions would be asked. But that is all pure speculation. But the numbers that appeared in the media, and through the tax authorities could not have been speculation. One cannot imagine the entire country getting into a speculative mood simultaneously, all of a sudden. The tax-free nature of agricultural income has made this the favourite method many politicians are said to use to convert their illegally gotten wealth into legitimate income. That is why agriculture is often referred to as a laundromat. Some of the politicians have disclosed figures that defy reasoning. Even if the most productive field were to be used for growing the most lucrative crop, incomes of those levels would just not be possible. Sadly, the income tax department – and the Finance Ministry – have kept silent on scrutinizing these returns. More painfully, even the judiciary has not asked questions. Had it done so, the PIL filed by Sharma would have been heard, and the truth would have come out. One way or the other, the ghost of huge agricultural incomes would have been put to rest. Strangely, even the opposition parties have chosen to stay quiet about this. I call this a collusive silence. Nothing makes sense for now. So we return to the question everyone has been asking. Will demonetisation root out black money? Maybe, yes. But only if the problem of agricultural income is addressed first.